1977 - The Italian Postal Service awarded a contract for the automation of the Parcel Center in Milan. 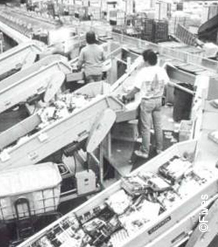 Between the 70s and the 80s, automated sorting systems were designed and installed all over Italy, according to the automation plan of Poste Italiane, aiming at updating its network. This included after sales services and maintenance contracts which are still in force today. 1979 - The TRISORT shoe sorter was invented and patented. 1982 - The SBIR cross belt sorter is invented and patented; it was by the U.S. Postal Service in 1982 and more than 300 sorters for “Small Parcels and Bundles” were supplied. Till then, more than 1,000 cross-belt were installed by Fives worldwide for many markets areas. 1999-2001 - The three Sorting companies (Italy, Japan and the U.S.) change name to Sandvik Sorting Systems. 2001 - The SBIR system is chosen by the Italian Post for processing trays. 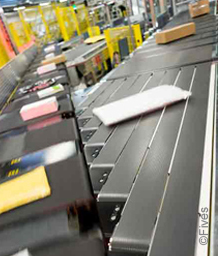 The cross belt sorter is not used for sorting only but also for the transportation and connection among different sub-processes inside the mail centers. 2004 - Hold Baggage Screening (HBS) and Early Baggage Storage systems are designed for SEA Malpensa Airport in Milan including 4 SBIR MD-BH, Carousel and Vertical Sort Conveyor. 2007 - Sorting companies are acquired by Fives Group and change name to Cinetic Sorting. To make the offer more understandable, Fives Group chooses to gather all its activities under a single brand and creates 19 business units among which Intralogistics that comprises companies in France, Italy, Japan, Korea, China and the United States - automate internal logistics streams for postal and courier companies, distribution centers, and baggage handling systems. With a strong legacy based on decades of expertise developing pioneering solutions in close partnership with customers and installations everywhere in the world, Fives is recognized as the leading provider of intralogistics solutions – a partner that helps customers maximize operational performance. Founded in 1975 and based in Lorient, Fives Syleps is a major player in intralogistics. The company is known for its full range of solutions for agri-business supply chains, e-commerce, distribution, and other manufacturing industries. Fives Syleps owes its success to its expertise in process engineering, industrial IT systems, and proprietary technological building blocks, particularly for storage and robot palletizing solutions for preparing orders.